Here we are at the Senior games of Brunswick County. We went down on April 2nd and chalked off the PB court for the start of the games on April 3rd. The lady next to the man and torch opened the ceremonies at the age of 97. she carried the torch around the park. There were 75 participants that day and all saw Pickleball being played . We started at 10;30 am and finished around 1:00 pm. We had 20-25 different people taking turns playing. 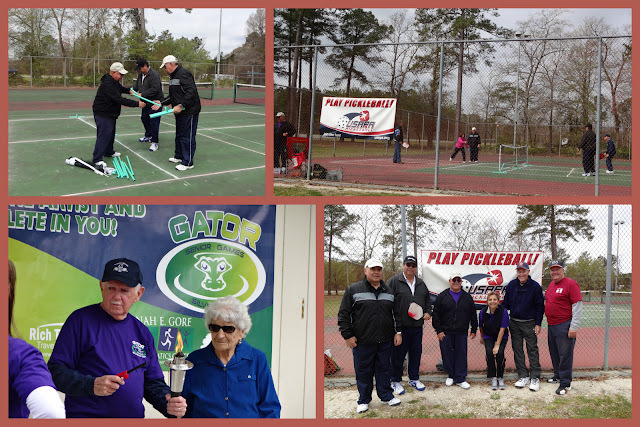 Brunswick County is looking forward to having pickleball in next years games. We also made a few contacts throughout the county. Our next demo is April 18th at Oak Island. Watch for comments and pics!